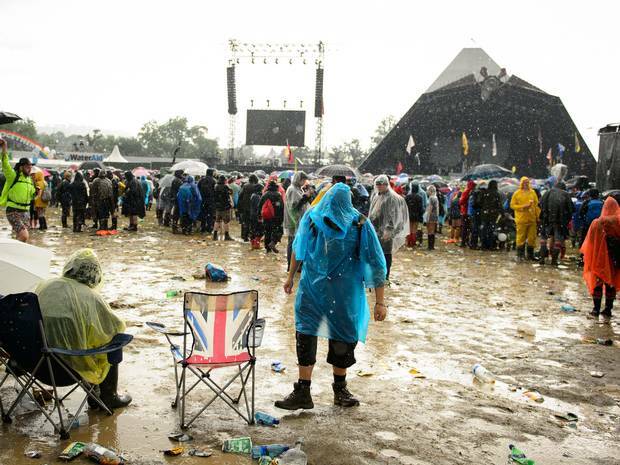 Rain doused this year Glastonbury Festival’s first day as fans enjoyed music on the main stages. Bring a bin bag. It will save you. Leave Glastonbury as you found it – tidy and beautiful. These are also essential when it comes to handling your wet and muddy clothes. Make sure your tent is strong and waterproof. Make sure it has a cover on top or fashion one out of a bin bag. Also, make sure it’s sturdy enough and pegged in thoroughly. Don’t camp at the bottom of a hill. It will be a mess. Take an extra tent. If there’s a few of you going in a group, it might be wise to take an extra tent just to store all of your wet and muddy gear in. Just don’t advertise the fact that there’s no one staying in it. Make sure you have a poncho. Don’t be that guy with an umbrella blocking everyone’s view of the stage. Man up and get yourself a poncho. You can either buy one, fashion one out of a bin bag, or accept a branded one from the many evil corporations who will be giving them out for free. Don’t foget your willies. Trying to maneuver around the site without wellies is like trying to sprint through concrete – and if you wait until you arrive to buy them, you’ll probably get ripped off. Mud-slides don’t do them. You may think you’re being whacky and kerr-azzy but you’ll probably catch dysentery.